Here we see three professional athletes. 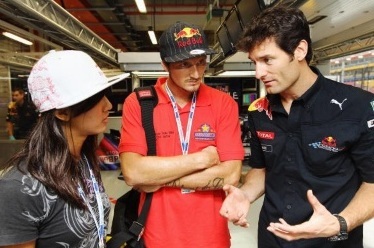 Sasha Christian (lady on left) and Julien Dupont (man in the middle) listen to Mark Webber (far right). They're all great at what they do. Sasha's a champion wake boarder, Julien is a freestyle (bicycle) rider and Mark drives Formula One cars. What I find interesting here is that Julien is out of his element and he's a bit defensive. Mark is also attracted to Sasha (She's also attracted to him). Mark and Sasha bodies are facing each other, while no one is facing Julien. Julien's arms are crossed in a classic defensive context. Marks arms are open with a palms-up display. Mark is taller and Julien's head is down turned. If he's looking at a taller person, his chin should be parallel to the ground or slightly upturned. Mark drives race cars, Julien rides bikes and Sasha looks great in a swimsuit. When both men are in the presence of an attractive female, it is not surprising that Mark is the dominant male.